This blog contains documentation of my work with links to collaborative projects. I work predominately with super 8 exploring the formal qualities of film; the frame, form and rhythm which are highlighted through looping. I showed a reconfiguration of Train Film (14:11) (orginally filmed in The Powerhub, Maidstone) at Tate Britain on Monday 24th February which was one of three expanded cinema events part of a four month programme of artists' film and video curated by Stuart Comer, formerly Tate, now chief curator Media and Performance, MoMA; George Clark, Tate Modern; and Melissa Blanchflower, Tate Britain; with independent curators Simon Payne and Andrew Vallance. 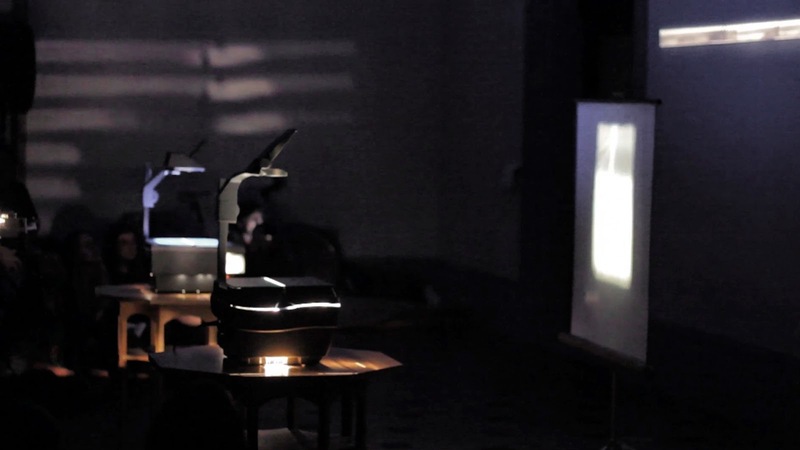 The new work incorporated two overhead projectors showing 2 of the original 3 filmstrips and a contact print of the filmstrips on standard 8 projected in between the static original filmstrips. 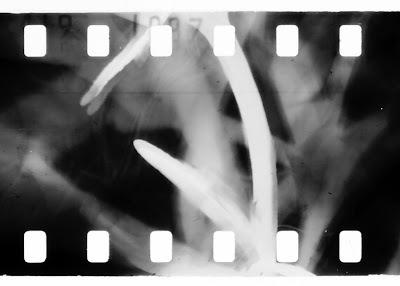 The image is a frameless pinhole photograph on 2ft lengths of super 8 black and white reversal film of the train speeding through the windows of the The Powerhub. The programme called Assembly: Near and Further Contact II included work by Nicky Hamlyn, Vicky Smith, Greg Pope and Lee Patterson and Torsten Lauschmann. I'm excited to be presenting at this symposium at The Sidney Cooper Gallery in Canterbury on Wednesday 19th February 2014. Organised by Dr. Andy Birtwistle of Canterbury Christ Church University, it promises to be a really interesting day. A one-day symposium exploring the changing dynamics of experimental film and video in the 21st century. Since the 1990s film and video have become common features of the gallery environment. However, while what is now termed ‘artists’ film and video’ has thrived within the white cube, and while 16mm film projection has survived thanks almost entirely to the gallery, experimental film and video makers have witnessed a decline in opportunities to show work on cinema screens, or to have their work broadcast on television. Meanwhile the growth of the internet has provided some film and video makers with an alternative means by which to reach audiences outside of the gallery. Although critics such as Chrissie Iles have seen the environment of the white cube as a liberation from the ‘restrictions’ of traditional cinema (“Cinema becomes a cocoon, inside which a crowd of relaxed idle bodies is fixed, hypnotized by simulations of reality projected onto a single screen”), what is lost and what is gained when experimental film is shown outside the dark cube – the environment in which it first developed and once thrived? This one-day conference explores the migration of art film and video to the gallery, and seeks to consider how the white cube has impacted upon the changing dynamics of experimental filmmaking in the 21st century. I'm preparing a paper for the Research Conference at the RCA on Friday and Saturday this week (10/11th January 2014), in a session titled The Role of the Analogue in the Digital Age which will be an interesting discussion to take part in. It's one I try not to highlight as I think we should get over this discussion of either / or - digital in nature in itself. However, I'm really happy to test some ideas out here, although could be a risky maneuver, but will obviously be contextualised with my research. The keynote speaker is Dr. Tereza Stehlíková also presenting is; Alex Jukes, Chunhui Meng (convener) and Dr. Birgitta Hosea, Research Leader, Central Saint Martins. So Far / So Good is a two day conference organised by the research community enrolled at the Royal College of Art. The program invites R.C.A. researchers to work with national and international research students to collaboratively present work and discussion within four curated sections of the event. Our theme is inspired by a leap in to the space of research and practice. I think it's sold out but the advice is turn up early for chance of a cancellation. The Friday session is based at the Battersea campus and the Saturday session at Kensington. Collective-iz curated a screening and performance programme at Summerhall in Edinburgh back in November, where Rosemary Again and Again was shown. 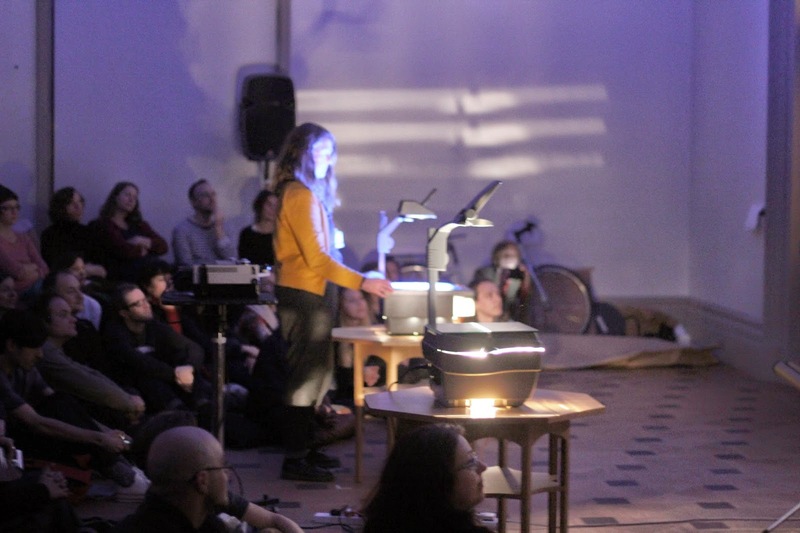 The programme was based on their event at the Horse Hospital in Bloomsbury back in February last year and included work by Neil Henderson and Jamie Jenkinson. Here's a nice write up of the evening by Luke Aspell and a link to more documentation. Rosemary, Again and Again is showing at Collective-iz's programme at The Summerhall in Edinburgh on Friday 22nd November. The programme kicks off with Assembly: I Extend my Arms on the 23rd November and is the first of a series of Sunday and Monday screenings and curated programmes between November 2013 and March 2014. 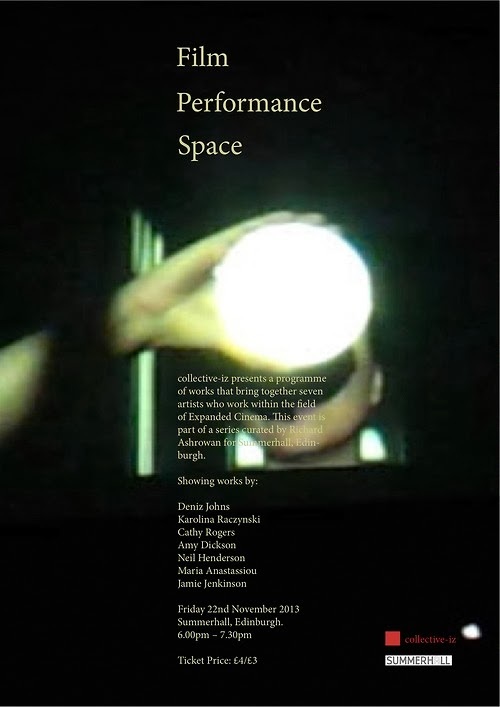 The programme has been curated by Stuart Comer, George Clarke, Melissa Blanchflower, Andrew Vallence and Simon Payne. The new 35th Anniversary issue of the Millennium Film Journal features an essay by A.L. Rees called 'Physical Optics: a return of the repressed' which surveys the proliferation in London over the last year of expanded cinema events. There's mention of Nightworks programmed by Andrew Vallance and myself and some stills from Rosemary, Again and Again. The entire issue is about the changing nature of 'artists' cinema' over 35 years since the publication of the first MFJ. You can get a copy by ordering online or through UK stockists in London at the ICA, Housemans, Foyles, Tate Modern and the BFI and in Canterbury at JG Palmer LLG, Northgate, The Cornerhouse Manchester and the Arnolfini, Bristol. The Millennium Film Journal is a bi-annual journal of avant-garde film and media art published by Millennium Film Workshop, New York since 1978. "We refer to Living Film with respect to the reversibility of the terms: film as object that is activated through physical contact and film as an ongoing mode of material practice that shapes the consciousness of, animates and enlivens its makers. At stake here is not just an artistic concept or method but the formation of a strategy towards an alternative filmmaking ecology: working with cheap or out of date film stocks; bartering knowledge for materials; finding cooperative forms for using resources and equipment." I particularly loved George Saxton's Blissfully Gunned Down a dual screen 16mm looped projection of a young man walking away from the camera, stumbling and then walking towards the camera and being, seemingly shot down and falling. At this point the film loops and starts again. The images on both loops are the same but don't run in tandem. Being sat quite near the front, I couldn't see, what was happening behind me, and was intrigued how the image was degrading as the performance progressed. It was explained after that George was scratching the film as it went through the projector. The rhythmic sound of the shot and the scratched film seemed to grow louder as the performance ended. "Blissfully Gunned Down, From an original collaboration with the late D. John Briscoe (1949-2013).. The original 50' of 16mm negative was shot in 1980 with John Briscoe who performs in these short sequences. John, later processed the neg in a bath. The neg was shelved and re-found in 2012. This was an uncompleted piece of film work. 33 years later the footage is resurrected, printed and finally performed." Other work that stood out for me was; James Holcombe and Asnan Adams, Hair in the Gate which is precisely that. James cut off lengths of his own hair and stuffed it in the gate of the 16 mm projector, the image was of hair bunching in the gate, getting stuck until the smell of burning hair filled the room. Also, for it's truly expanded nature, and their use of the photogram process, Viktoria Schmid's Foodfilms. The audience were invited to eat the final dish concocted of the ingredients which appeared on the film. Nicky Hamlyn has written a full review of the evening here. For the full programme, see No.w.here's website. I'm showing Rosemary Again and Again as part of a programme called Living Film, at No.w.here on Wednesday 16th October 2013 7pm. Programmed by Vicky Smith and Karel Doing. It promises to be a great evening, here are details of the full programme, booking and venue address.